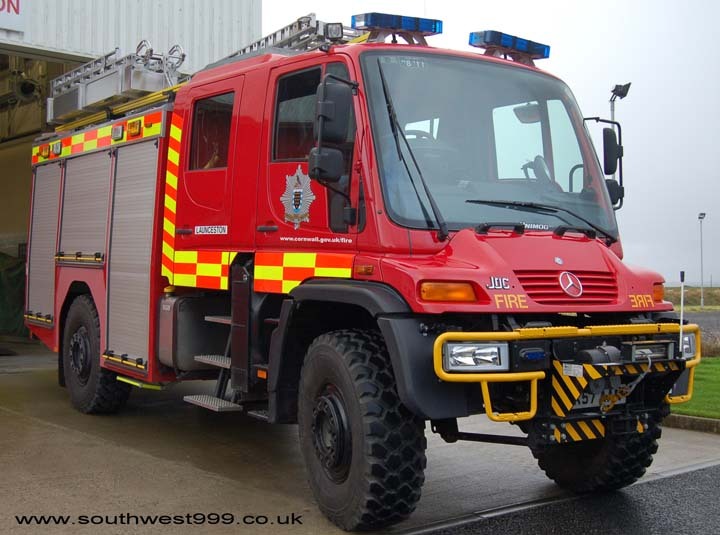 Mercedes U500 Unimog/TVAC/JDC Polybilt Water Tender from Fire Station Launceston, Cornwall County Fire Brigade. Added by Adam Moore on 01 December 2007. Added by GARY CHAPMAN on 01 December 2007. The Reg on this vehicle is WK57 AAN.For more details on this appliances and others in Cornwall click on links on this Website.There are some nice looking appliances.Pete M.
Added by Pete Matten on 01 December 2007.
the crew cab was built by TVAC, the body by JDC using a Polybilt premoulded body! fire engine bodybuilding has got complicated! Added by Peter Williams on 03 December 2007.
thats a very ungainly but intimidating appliance!!! - can this appliance attend any calls or is it mainly just used for moorland fires etc? Added by Gary Chapman on 15 March 2008. Thanks for that Gary - do you know if cornwall are to get any more of these? Added by Alex on 16 March 2008. Added by Gary Chapman on 16 March 2008.